Meet the Aberdeenshire producer. 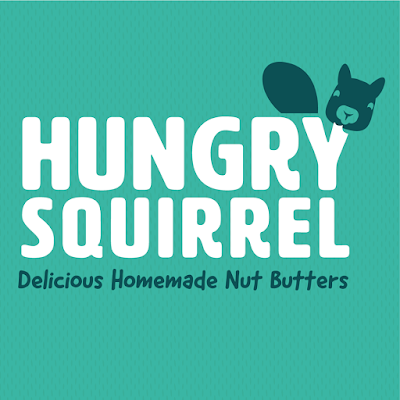 Going nuts with Susan Yule and Hazel Farquhar of Hungry Squirrel Nut Butters. Completely natural products, vegan friendly with no refined sugars, palm oil or artificial flavourings. Their delicious and nutritious Nut Butters bring all the Squirrels to the yard. In my biog I state that I'm partial to Cheese, Gin, Peanut Butter and Rhubarb and that I'm permanently looking for the recipe that can successfully combine them all. (The hunt continues...) Peanut Butter is something that I have loved for as long as I can remember. As a child it always seemed rather exotic and exciting - particularly in relation to the US of A and PB&J sandwiches! I actually know when my first taste of another nut butter was as I wrote about back in April 2013 on a visit to the Scottish Crannog Centre. Turns out that in Iron Age Scotland they may well have been eating Hazelnut Butter so the whole nut butter craze of recent years has actually been around for much longer that the hipsters would have us believe. 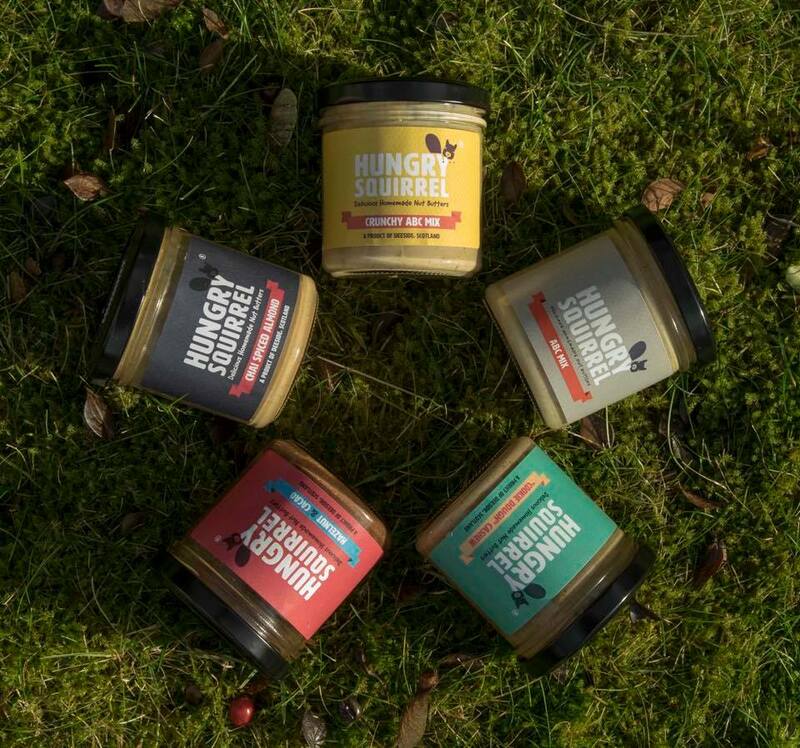 I was very excited when I first heard via a mutual friend last year that there was a producer in Deeside who had started making a range of nut butters. I was even more excited when they gave me one of their Hungry Squirrel taster packs to try out. Alas I have failed to convert my daughter from Nutella to Hazelnut & Cacao but myself and my son are both particularly big fans of Crunchy ABC Mix and Cookie Dough. 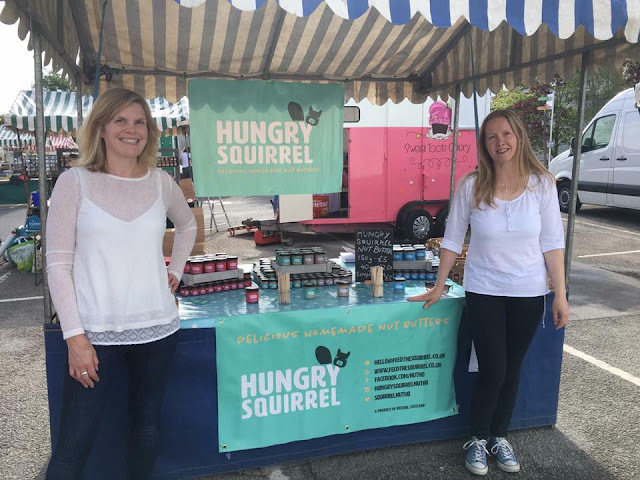 Having consumed a number of jars of assorted flavours of Hungry Squirrel and met the ladies behind the brand at a couple of events (and introduced them to squirrel spreaders) I wanted to find out a bit more about how they developed and produced their product. So I scampered off to Squirrel Nut HQ to get the low down. I was greeted by Hazel in a hairnet and apron and the most amazing smell of roasted nuts. I'm not sure quite what I expected in terms of their production facility but I was somewhat surprised to discover that for the time being it consists of a couple of food processors in the corner of the kitchen. This is most definately a handmade artisan product. As far removed from a production line as it's possible to get with a whole lot of love and passion in every jar. 30kg of nuts a week are required for current production levels and these are oven roasted before they head into the food processors to be blended. They aren't industrial machines but the ladies did admit that they've already burnt out two so far! Jam jars and lids are sterilised exactly the way I would do at home when making jam. The only non domestic piece of equipment in the kitchen is food production digital scales for weighing ingredients and the finished product. The equipment is swapped between Susan and Hazel's kitchen depending on whom is squirrelling away on a particular day. There is much excitement in the drey as an industrial food processor is on order which should speed up the process and provide aditional production capacity. I began to think that this Nut Butter business was much more simple than I had imagined. The raw ingredients used are actually very basic. No complicated list of ingredients on the labels for any Hungry Squirrel products. Nuts, agave, maple syrup, cacao, salt and spices. That's it! Of course the secret is getting all of those ingredients in the right amounts to create a delicious Nut Butter. This is something that Hazel and Susan have had to do a lot of experimenting with to perfect their recipes. They continue to do so as they adapt existing products - such as switching out honey to make them suitable for vegans - and creating new flavour combinations. I am personally very excited about the prospect of a Pistachio Butter - possibly my favourite nut and one I have been nagging them to create since the outset! A little squirrel told me that I might not have long to wait for that one. Whilst the process and ingredients may be relatively simple it is also very noisy and time consuming. A full food processor of nuts is deafening and it can take up to 45 minutes to blend just one batch from nut to butter. Once the correct consistency is reached any flavourings and/or natural sweeteners are added before the butter is weighed out into sterilised jars. I like my nut butter crunchy (a Crucnhy Cookie Dough is on my wish list...) and for this a quantity is removed at the start of the process and reintroduced towards the end. Finally labels are applied by hand before the jars are sent out to customers via mail order, delivered to retailers or taken to be sold at Farmers Markets. A full bowl of nuts seemed to turn into a very small amount of nut butter and the whole proces from start to finish came across very much as a labour of love. Both ladies are clearly passionate about their business and so they should be as they have a uniquie, delicious and versatile range of products. I am somewhat tempted to have a try at making my own Nut Butter but perhaps for now I might just invest in one of their new large 1kg tubs. The only problem with this is that I fear it would still vanish rather quickly. What's your name and where do you come from? Susan Yule and Hazel Farquhar – we both live in Peterculter, Aberdeen. Susan was brought up there and Hazel hails from Buckie, Aberdeenshire originally. How did you end up in the Nut Butter business? 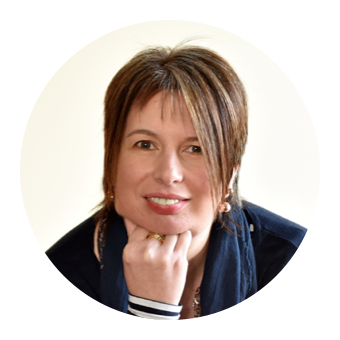 Susan developed an intolerance to peanuts and had instead been using almond butter as a healthy snack, but was getting bored with it and wasn’t overly excited by the alternatives available in the shops – thereby identifying a gap in the market. Hazel was made redundant from the Oil & Gas sector in June 2016 and was considering alternative career paths. Susan approached Hazel with her idea in November 2016, Hazel loved it and so the Hungry Squirrel journey began! What's the best and worst thing about your job? One of the best things about this job has been connecting with our customers at the markets and events we attend – we were so uncertain of the reception we’d get when we started the business last year, but it has been great and seeing repeat customers and receiving positive feedback about something that you are creating is the greatest reward! We’ve also loved joining this amazing community of local producers – they really are a lovely bunch. I can’t honestly think of a worst thing…. I suppose the risk of setting up a new business and the sacrifices you make in order to do that. 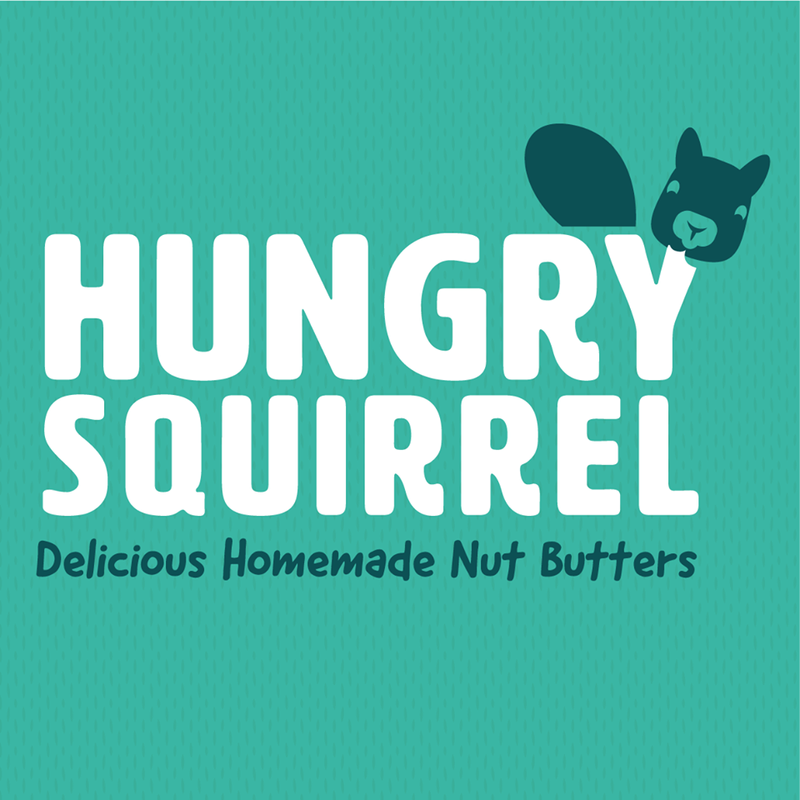 What makes Hungry Squirrel different? Our ethos was always to keep the ingredients simple, natural and never to use palm oil. To avoid refined sugar and to keep the addition of natural sugars to an absolute minimum. The plan was to create a healthy product that could be easily incorporated into a variety of snacks and meals. High in fibre, protein and with no added sugars they appeal to a wide range of consumers including vegans, diabetics, those following a sugar free diet or who are lactose intolerant and individuals following health and/or fitness regimes. The ingredients we do use are carefully selected for their track record of health benefits and nuts, our key ingredient, are an essential part of the human diet with wide ranging health benefits, predominantly associated with reduced risk of coronary disease and increased life expectancy. Hungry Squirrel nut butters are healthier than the majority of other nut butters you can buy in the supermarket. Where and how can people buy your products? Hungry Squirrel attend the monthly Thistle Street Market in Aberdeen and Ballater Farmers market in Aberdeenshire. We’ll be at Taste of Grampian again this year too. The Hungry Squirrel online store has the entire range available alongside a range of gift packs. In Aberdeenshire at: Finzean Estate & Farm Shop, The Green Grocer, Inverurie, Manna, Elgin, The Unit Gym, Banchory, Westhill Service Station, Raemoir Garden Centre and in St. Andrews at Balgove Larder . We are currently looking at other retail outlets around Scotland and hope to be able to announce more very soon. What next for Hungry Squirrel? We are about to release 2 new flavours into the range with another two flavours scheduled for later this year. We have other ideas in the pipeline, but it’s too early to make any announcements just yet. Lastly, share the love and recommend another Aberdeen/shire producer? Well that’s tricky as there are just so many exciting producers around right now! But lets go with “From Bakery Lane” – Alice is amazing and produces so many great tasting products. Can we recommend two? Also have to recommend The Alexander Smokery.